TR13CE: Wranglers: Real. Uncomfortable. Snakes. 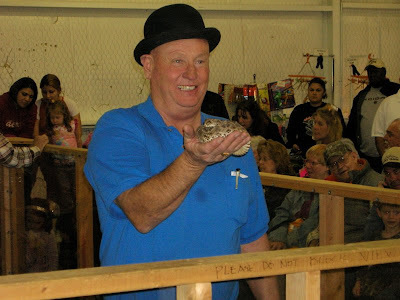 This is The Snake Man, Jackie Bibby. That snake! That smile! That hat!?! 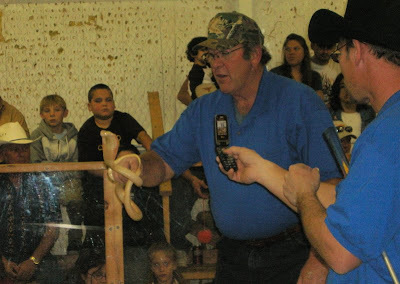 I checked out the Rattlesnake Roundup last Saturday at the Community Center in Oglesby. Two bucks worth o' entertainment captured digitally follows. I must admit that I debated whether to attend this oddity. I feared they would slaughter and supper-ize the snakes (unfounded, however there were plenty of snakeskin goods available). I'm glad I went. I used to see Western diamondbacks daily at San Angelo State Park, so it was nice to reconnect with them. 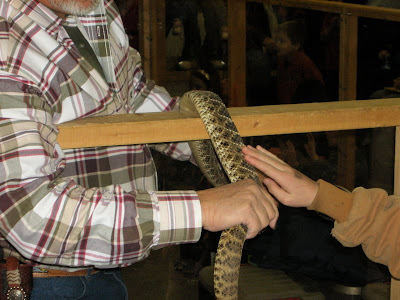 And as far as I could tell, the wrangling show didn't harm the snakes. And I was exposed to a piece of Coryell County culture. A piece that I most assuredly will never experience again. 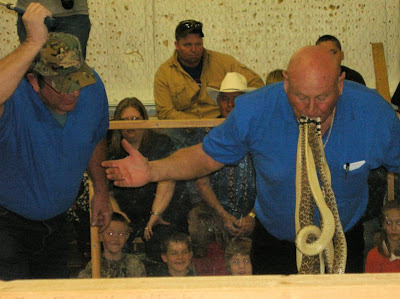 His record is 8 snakes. He's shared a sleeping bag with 109 and a bath tub with 81. Guinness recognizes his feats, and so should you. Snakeskin — Not just for boots and belts, but for touchin', too. 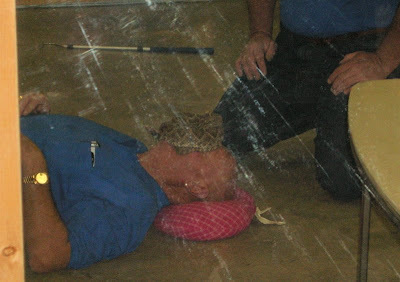 He's lying in a cage with about 30 or so rattlers. Oh yeah, and one's on his effin' face. Thanks so much for sharing the snake pics! Did you get to touch them too? Nope. Sure didn't. Me, scared? Uh, yeah, kinda. We've gone rattlesnake hunting. We cure the skins, but also eat the meat. It is great fried or put into stew. Surprisingly, it is also good with a little added cinnamon. My first pet as a married woman: A rattlesnake. Yep, that lasted about a week when I made the hubs let it go in the field in front of our house.